An inter-reserve sports tournament was held on Saturday, 1 September in the community of Paterson, Eastern Cape. Two Shamwari staff members who are passionate about their community came up with this wonderful idea. They managed to put this tournament into action. 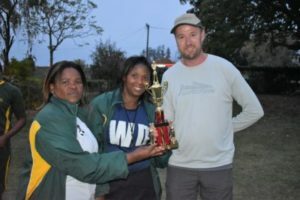 Shamwari Private Game Reserve sponsored this event to encourage morale in and among the community and our staff members. Thulani Gocina and Siviwe Walli are dedicated staff members of our Central Kitchen. Combining passion and commitment, these two wonderful staff members can be proud of their achievement of bringing the community together. 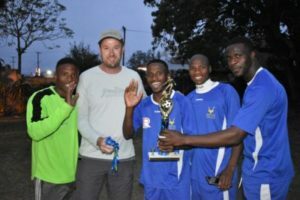 Addo Elephant National Park (SAN Parks), Kwandwe Private Game Reserve and Shamwari Private Game Reserve’s staff teams participated in the tournament by representing the reserves. Several soccer and netball matches were played between the reserves to determine the winners. The teams all displayed great team spirit! The supporters thoroughly enjoyed watching the tournament and cheered as the teams put on a fantastic display of healthy competition. The Addo Elephant National Park teams came out on top winning both the soccer and netball matches. Kwandwe came out in second place while Shamwari took home third place. The prizegiving was held in Paterson. General Manager, Gunther Strauss, handed out the trophies and medals to the teams. Food was provided to the teams who had all worked up quite an appetite after the successful day. With Addo taking first place, the tournament will be held on their grounds next year. We hope to include more reserves in some great inter-reserve competition! On the 29th of May 2017, 25 members of the Shamwari Team headed to Port Elizabeth to participate in a beach clean-up. As part of the many celebratory initiatives Shamwari Game Reserve is organising for our 25th Anniversary, the Shamwari Game Reserve team, including Rangers,..